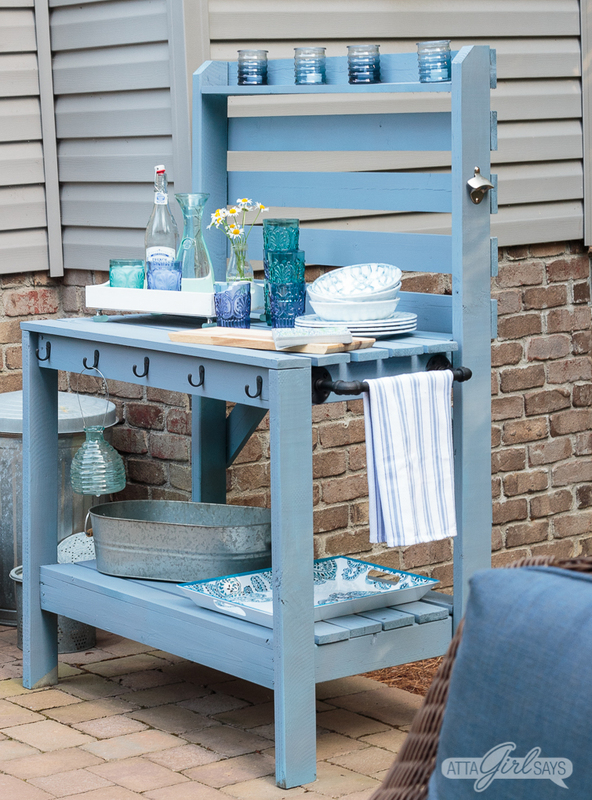 Giving your painted outdoor furniture a makeover is an easy way to refresh your patio, porch, deck and other outdoor spaces for the season. 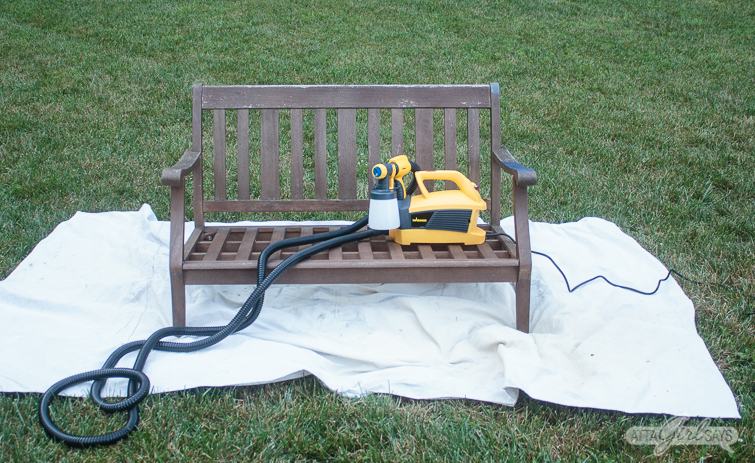 Using a paint sprayer makes the job quick and easy. This post is sponsored by Wagner, but all opinions are my own. 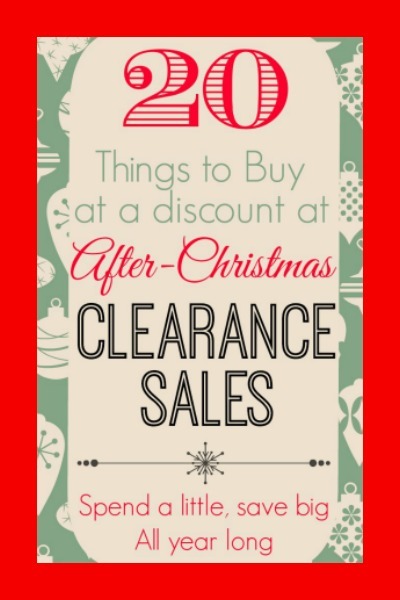 It also contains affiliate links, for your shopping convenience. If you make a purchase based on my referral, I earn a small commission. Read my full disclosure policy here. After several years in the elements, our painted outdoor furniture was in need of a makeover to restore its former beauty. Sun, rain, snow and just general use had been particularly hard on the outdoor buffet server we built for our patio. 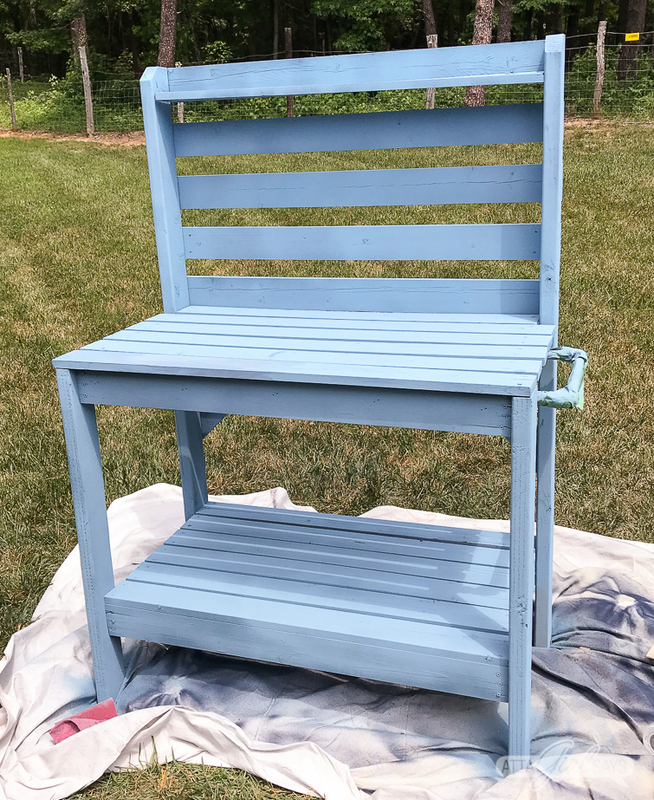 The original stain and milk paint finish had almost completely washed away and faded in the sun. Here, you can see a side-by-side of the potting bench server when it was brand new, what it looked like after two years in the elements and what it looks like now, after a fresh coat of outdoor paint applied with my Wagner FLEXiO 4000 sprayer. Such a transformation, and it was finished in an afternoon! 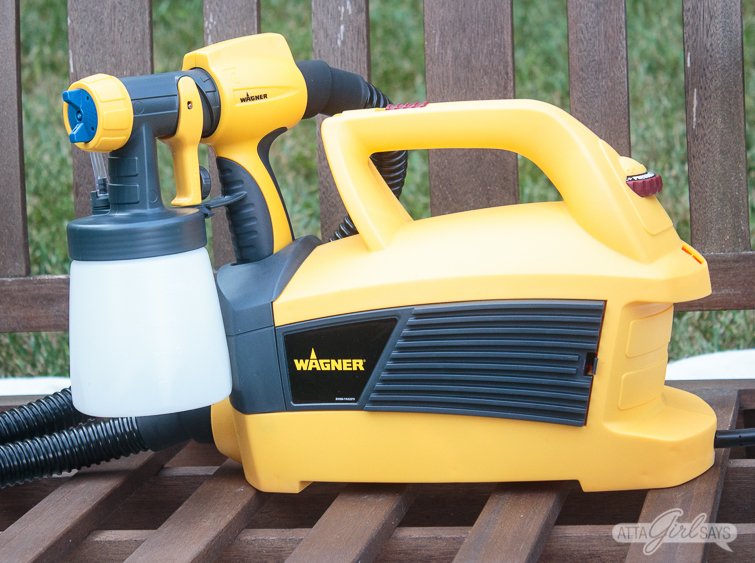 I’m excited to be partnering with Wagner and some blogging friends to show you how quick and easy it is to give your outdoor furniture a makeover with a paint sprayer. 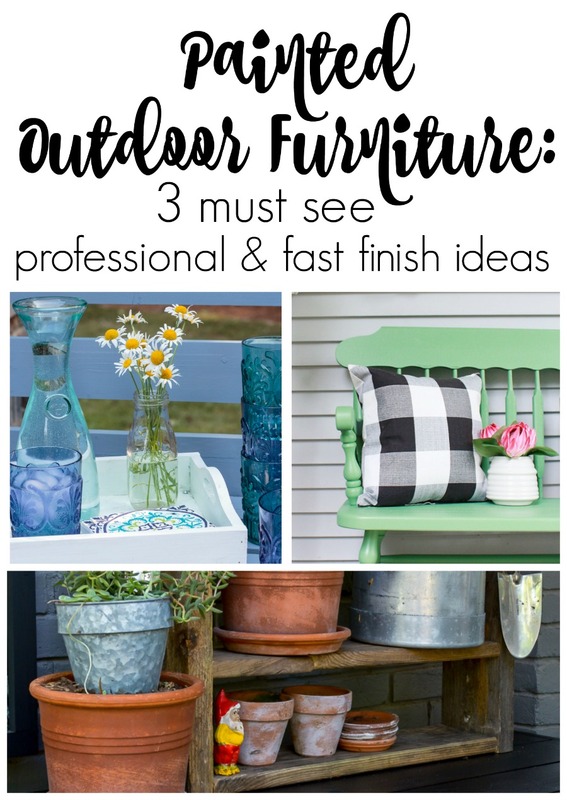 You’ll find links to their painted outdoor furniture projects at the end of this post. 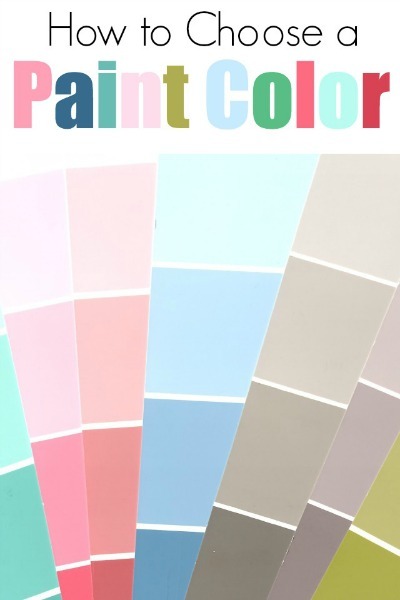 Be sure to visit them all for lots of tips and tricks on how to use a paint sprayer with all different types of paints, stains and finishes. 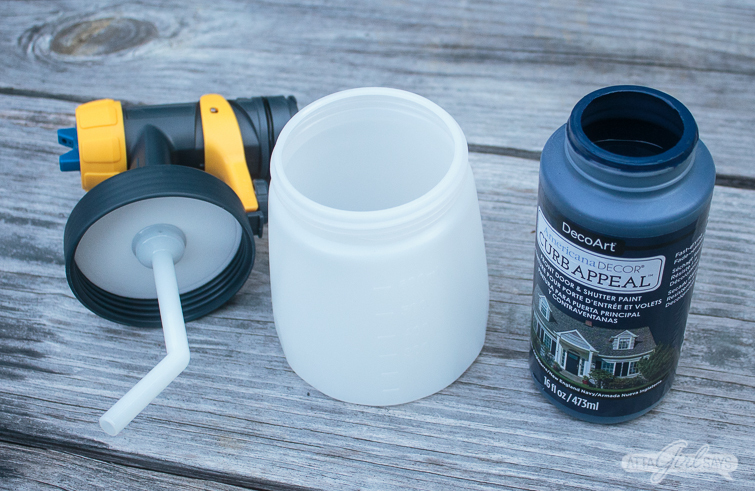 You’ll also find lots of good paint sprayer tips in this post of mine. I used the sprayer to make over two different pieces of furniture for our patio entertaining space. I was actually thinking of throwing this old bench away and replacing it, but I’m so glad I didn’t. It looks fabulous now, nothing like the grungy before pic! 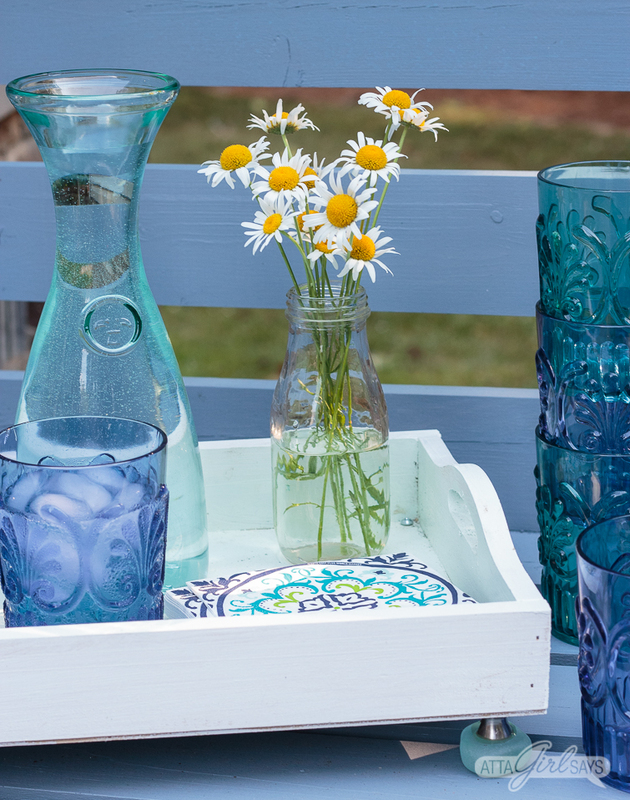 Before beginning an outdoor painted furniture makeover, it’s important to do a little prep work. 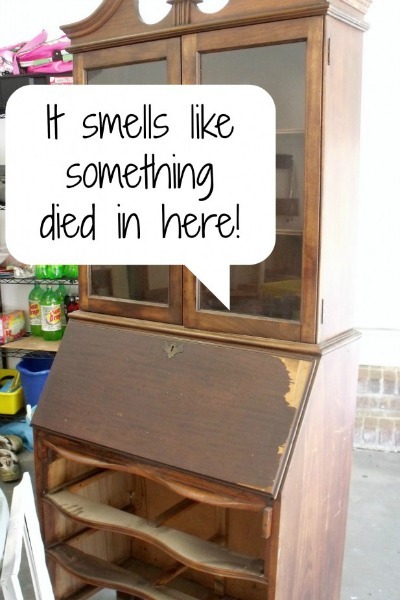 I recommend wiping down the furniture with water and a cleaner like TSP to remove any dirt, grime and spiderwebs. I also sanded the potting bench a bit to even out the finish and remove any chipping paint. Make sure your furniture is completely dry before painting it. If it’s been rainy or particularly humid, wait a few days so the paint can properly adhere to the surface. I prefer to paint in the early morning or in the early evening, once the sun has started to set. This is partly so I don’t overheat in this hot North Carolina summer weather, but also so that the paint doesn’t dry too quickly. I also avoid windy days to reduce overspray. 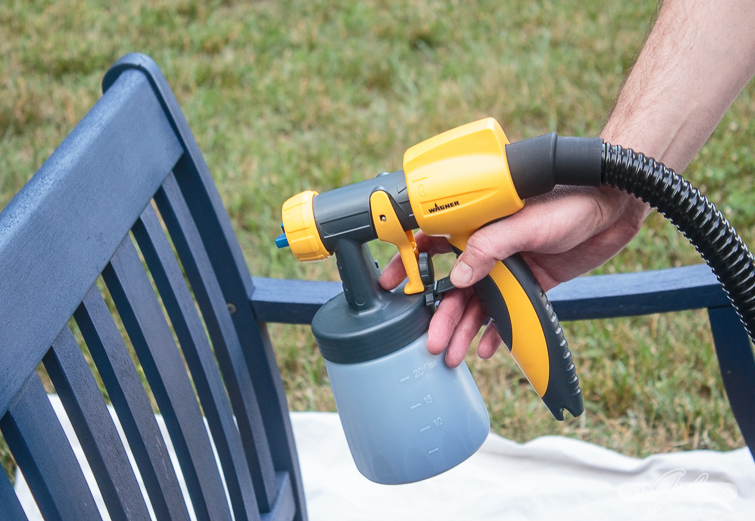 The compact sprayer is really easy to set up and use, and the 15-foot cord makes it easy paint all around a piece — front and back — without having to move lots of cumbersome equipment or cords. The sprayer comes with two different nozzles. The larger iSpray® nozzle and paint cup is designed for larger surfaces, like walls and ceilings. The detail nozzle, which is what I prefer to use, is perfect for furniture. I used it on both the bench and the outdoor server. 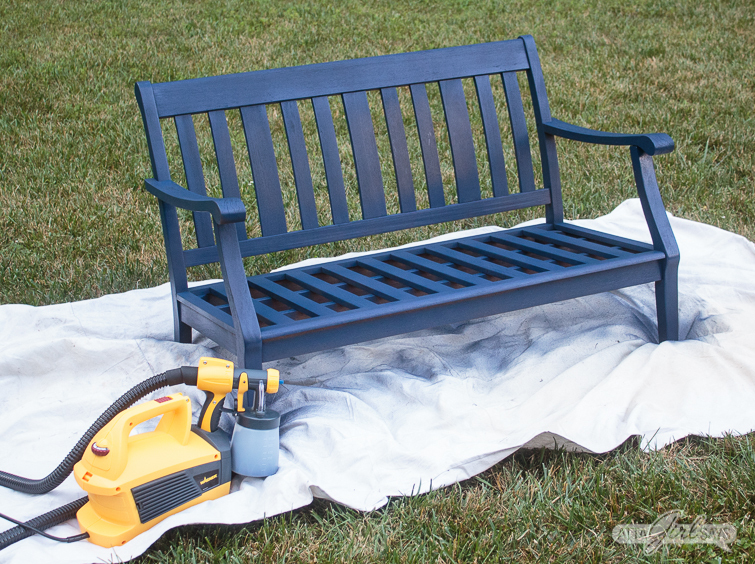 For the loveseat bench, I used DecoArt Americana Deco Curb Appeal Paint in New England Navy. The fade-resistant exterior paint is designed for front doors and doesn’t require a sealer. I didn’t have to thin the paint at all when using it with the Wagner sprayer. If you’re using a thicker paint, you may have to thin it slightly so it doesn’t clog the sprayer. (You can use water to thin water-based paint.) You can also control the flow of paint through the sprayer by adjusting the air compressor. 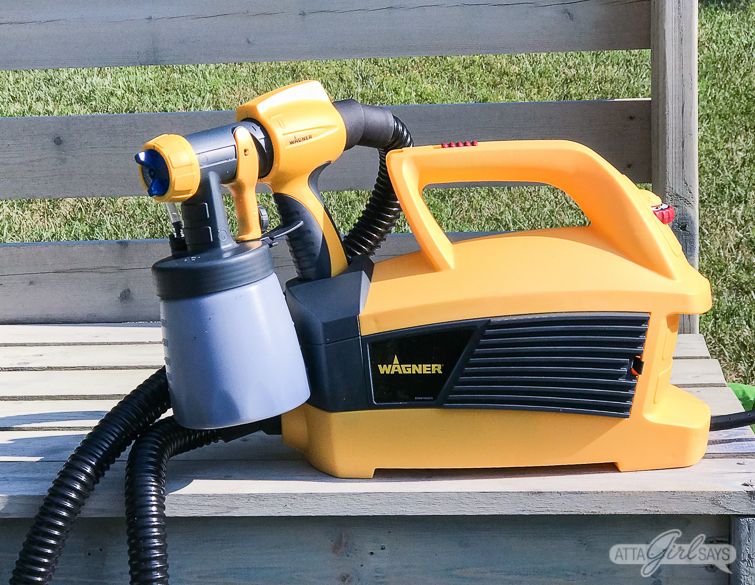 I’ve used a variety of different types and brands of paints in my Wagner sprayers –including latex, DecoArt Chalky Finish, DecoArt Curb Appeal, DecoArt Color Stain, DecoArt Outdoor Paint, General Finishes Milk Paint and other brands of chalk paint. I’ve never had to thin the paint with my Wagner sprayer, unlike other sprayers I have used. Depending on the type of paint you use, you may have to adjust the air pressure to ensure an even flow. 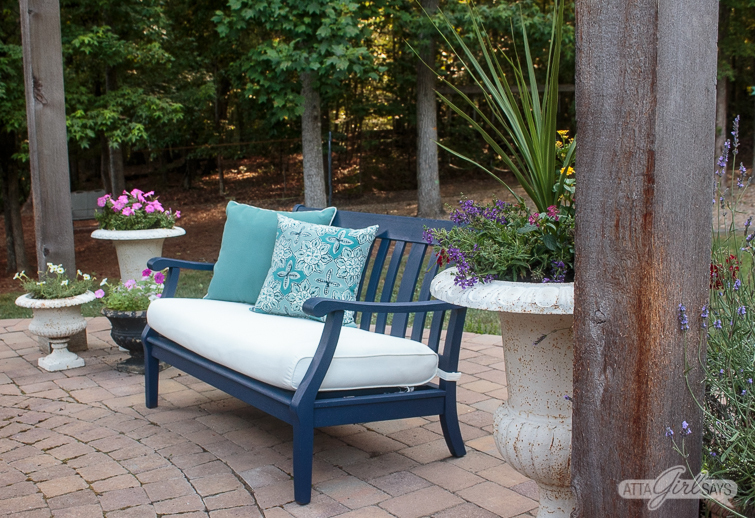 For this particular piece, I custom mixed a color using DecoArt Chalky Finish in Colonial and DecoArt Outdoor Living in Rock Garden. After two coats, the color was still a little too bright blue for my liking — even as a Carolina grad! 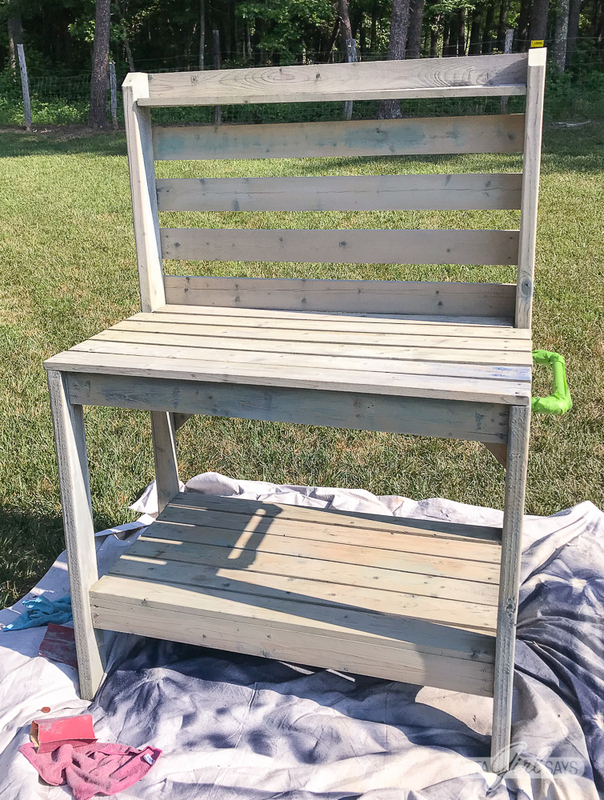 So I sprayed on a thin coat of DecoArt Color Stain in Ash Gray to tone things down a bit and add a little “age” to my painted outdoor furniture. I love the muted color. 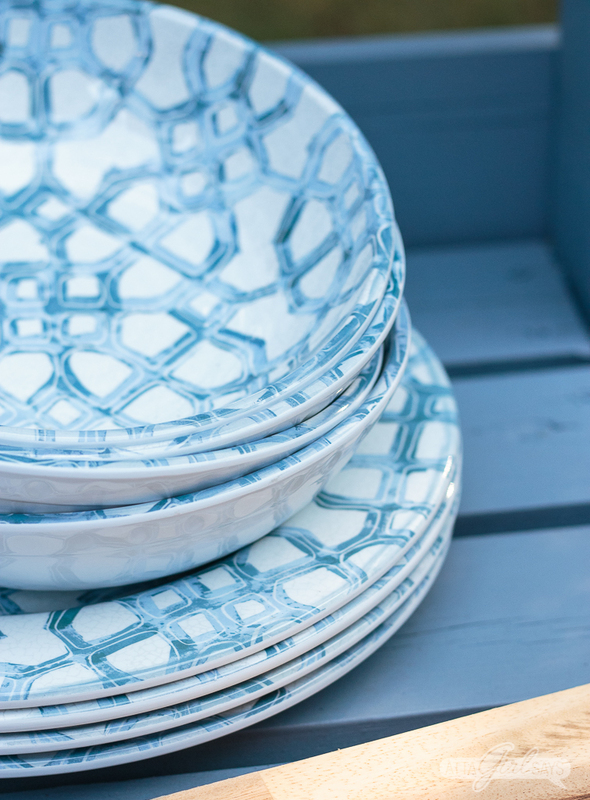 It even matches my new outdoor dishes from Christmas Tree Shops! I’ll admit, I was not looking forward to repainting this server because it was such a chore originally. The first time we painted it, my husband and I spent hours in the hot sun layering on milk paint and stain. It took so long to paint between all those slats using a brush. We were hot, sweaty, tired and irritable when it was done. This makeover, by comparison, took little more than an hour of hands-on time, including cleaning, sanding, taping off the hardware and painting. Once again, our patio looks and feels so inviting. 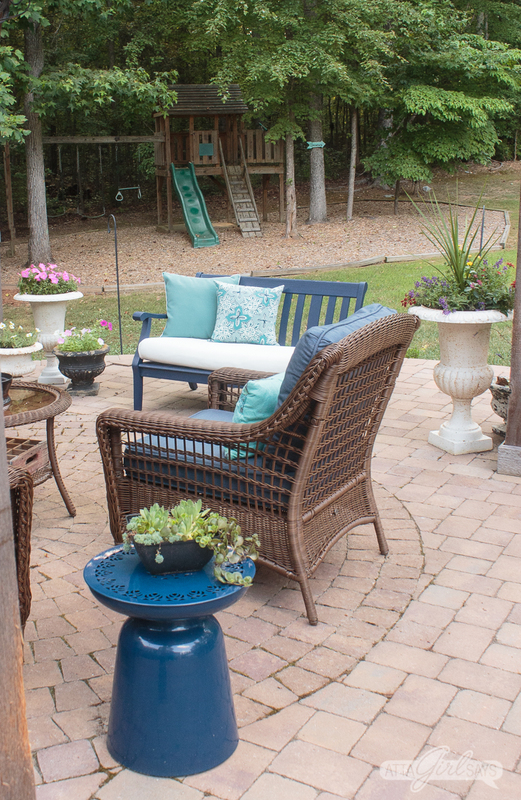 We’ve been enjoying hanging out in this outdoor room on long summer nights! It’s the perfect place to relax, read, entertain and enjoy nature. 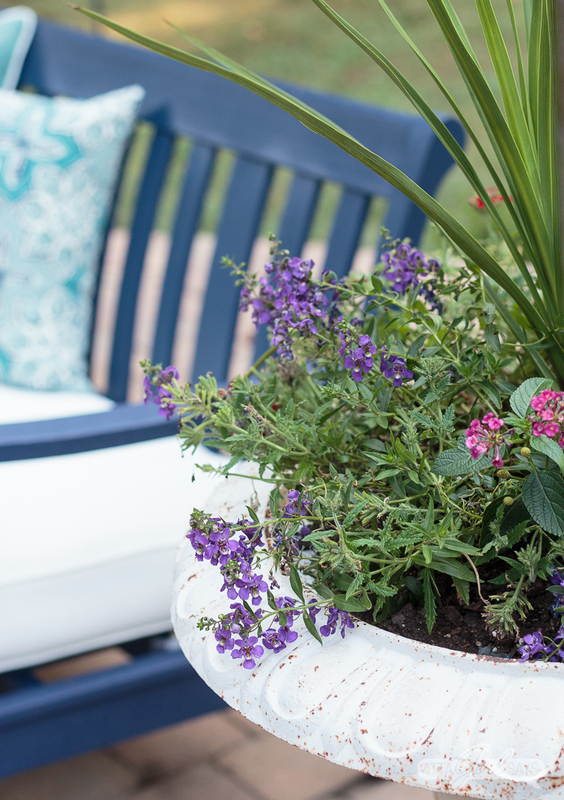 Don’t forget to pin this post so you can reference it when you tackle your own paint sprayer projects and painted outdoor furniture makeovers. This is super cute! 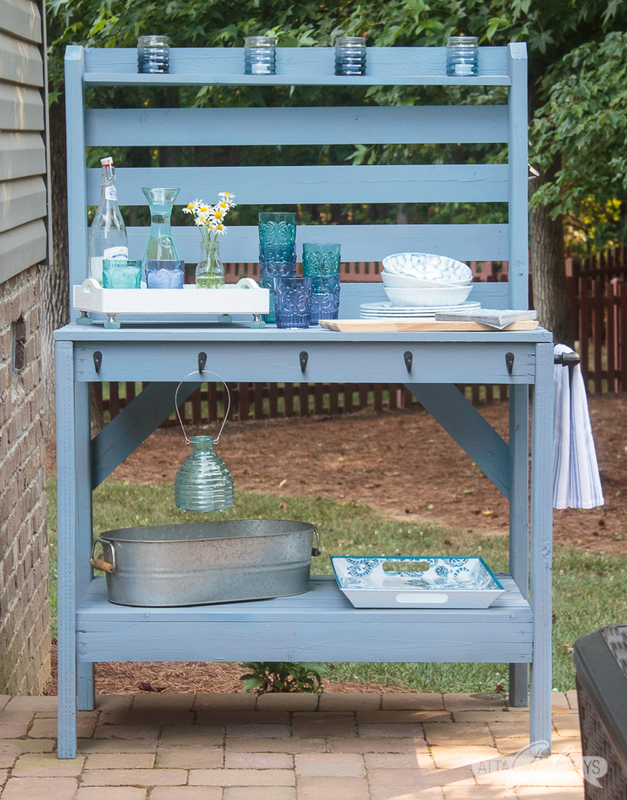 I have an old potting bench and now I want to turn it into a server like yours!! Your outdoor space is so cozy and inviting. Great project! Thanks so much, Kristy! We love having the potting bench as a server. 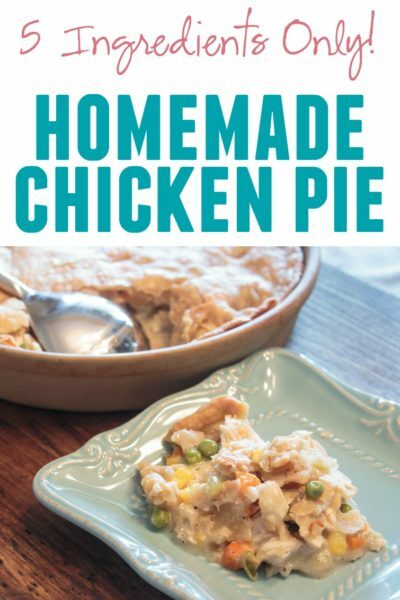 It’s so handy for parties or when we eat outside. Of course, now I want another potting bench to actually use for potting! I guess that’s my next project. I love this so much! 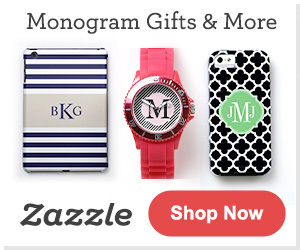 The color palette is so fun and cheerful! Can’t wait to hang out sometime over drinks! I love the colors you chose! I have been wanting a sprayer for quite some time. I will have to go take a look at them because I am not the best brush painter! You answered my main question about thinning paint, too. Glad you found it helpful. I think you’ll like the sprayer; it’s definitely a timesaver. And you don’t really have to worry about messy drips either. Now I want to paint spray everything. I love the colors you chose! Me too! Paint all the things! The kid, cat and hubby better watch out! I need this paint sprayer!! We have outdoor chairs that need repainting!! Love your transformations! Gorgeous! I love this sprayer, Heather. It’s so lightweight and works great. You’ll want to spray everything when you get it. 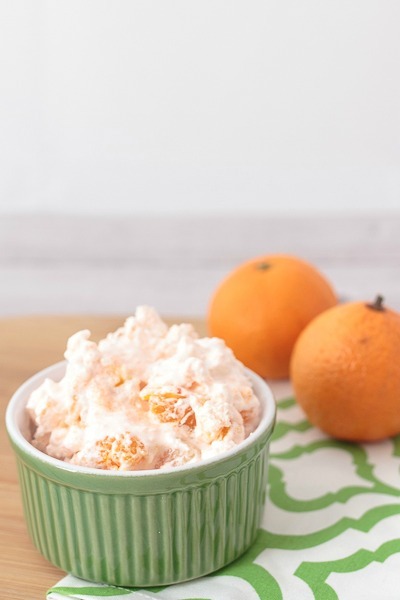 You have such awesome projects! I love how the outdoor server came out! I love the colors you have used, my favorites. Beautiful, serene patio. 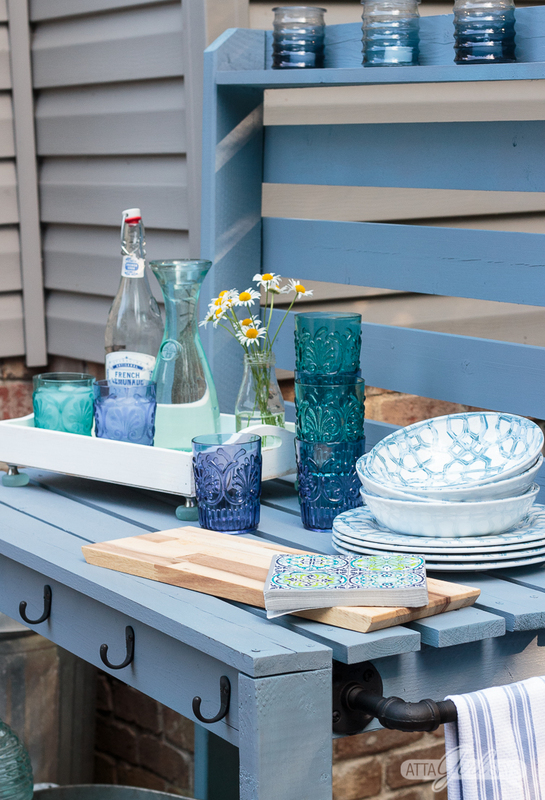 When you painted the bench, did it take more than one bottle of paint? Oh, you have a great eye for photography. Thank you so much. And the bench didn’t take very much paint at all. I think I used less than half of the jar of front door paint. The potting bench took a little more because it was larger.